I chickened out of the 2km attempt yesterday. I wanted to do it at home, but hay fever and other excuses got in the way. So I had to do it today. I chose to row it on an erg at the rowing club, before my row with Romana. I asked her to cheer. I was lucky. There were a few other Masters rowers in the weights room. Too bad I forgot to bring my training shoes. I should permanently store an old pair in my locker at the rowing club. Why not? Well, I would row this one barefoot, then. I did a 2km warming up with a few bursts, then dialed up a 2km, took a deep breath and I was off. Romana was chatting with the 2 guys in the weights room. What, she was supposed to cheer! The plan was to go at 1:44-1:45 pace and see where it ends up. First 500m was without any problems, in 1:44. Second 500m went by and I was still seeing the 6:55 predicted end time on the monitor. The problems started in the third one. Luckily, that was about the time when Romana finally came over to stand behind me and cheer. I even saw a few 1:43s when she started to cheer me. But it was very painful. After 750 to go I had to close my eyes. At 500m to go I had three people cheering me. Luckily. I was very close to handing down. Come on, 350 to go! I was rowing with eyes closed and listening to the instructions, which were telling me to quit the 1:47s and bring back the 1:45s. Come on, the last minute! I started counting strokes. Lost count. 250m to go! I started counting again. I was delighted to see a sub 7 time, but a bit disappointed after the hope giving 6:56 that I saw during the first km. Well, as a Season’s Best I will take it! Also just above 900 nonathlon points, which was my target. Still have to do a 500m and a 1km before the end of the month. Then we had a delightful 8km steady state in the double. 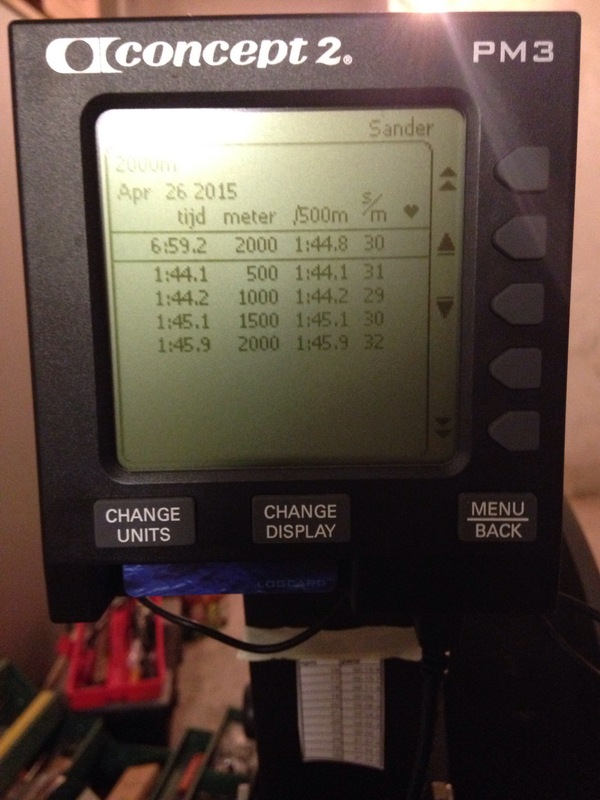 I took the picture from my home erg, transferring the result to it using the log card.